New Delhi: Tourism in India has started taking a hit on the back of a global economic slowdown and recent bomb blasts in cities. Going by the rise in cancellations and fall in queries from foreign travellers, travel firms and hotels expect business to drop 10-20% in the travel season that started in October. The inbound business divisions, mainly catering to leisure travel, of companies such as Thomas Cook (India) Ltd, Kuoni Destination Management India, Trans India Holidays and Stic Travel Group, are seeing lower bookings and queries for the next three-four months, and some cancellations, particularly from American and European travellers. “All of us are tightening our belts, fearing bad times," said Kapil Goswamy, managing director of Trans India Holidays. “The trend of new bookings has been negative for the last month-and-a-half, and very few new bookings are coming in for Christmas, New Year and early 2009." Thomas Cook has already seen a 15% drop in overall business and a 10% decline in inbound travel. 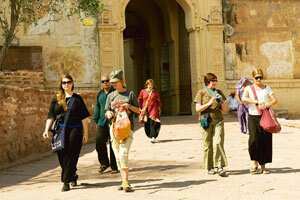 Analysts say foreign tourists make up 70-80% of revenues of star-rated hotels in India. While Kuoni and Stic claim that October-December looks strong because inbound travellers normally book tours 90-100 days in advance, they are seeing a dip in queries and bookings for the first three months of the next year. The US and Europe together contribute more than 65% of Kuoni’s business, while they make up for 75% of Stic’s inbound travellers. “We do expect that there will be a 20% decline in sales and the total number of travellers coming to India in the first three months of 2009," said Dipak Deva, chief operating officer (India and South Asia) at Kuoni. “We are expecting the US, Europe share to decline as we look at targeting new markets to offset markets that may be deeply impacted by the current slowdown." Analysts say holiday cancellations are rising due to the credit crunch and star-rated hotels are feeling the pinch of a palpable slowdown after a two-year bull run. Room occupancies have plunged, corporate discounts have got bigger, and restaurant customers have dropped, while expansion plans have been put on hold. “Many bookings are being cancelled last minute because people’s credit lines have been halved and they are relying on their credit card to go on holiday. Also, as most hotels are still assessing the inflationary market, they are offering corporate discounts, in some cases as high as 40-50%, and better deals to keep the clients hooked," said Dhananjay Kumar, principal consultant (ho-spitality) at consultancy firm Technopak Advisors Pvt. Ltd. According to industry estimates, during May-October, hotels reported occupancies of 70% against 75% last year. In the last six months, the average occupancy rate across the industry fell by 10%, impacted by the US subprime crisis that began in September last year, as well as incidents of terror attacks in India. Foreign travellers contributed 56% to the occupancy at the 19 business hotels run by Lemon Tree Hotel Co.across India. Of this, 40% business was generated by travellers from the US and the European Union. “We expect this to decline by over 20% this year," said Rahul Pandit, vice-president (operations) at Lemon Tree. But officials at the Leela Palaces Hotels and Resorts said the leisure hotel has not been hit by last-minute cancellations because majority of its foreign travellers are from Russia and the Scandinavian nations, where the impact of the slowdown is not so severe yet. “We are still waiting and watching, and have given the allocations to tour operators and will only know by mid-November how this season is panning out," said Vivek Nair, vice-chairman and managing director at the Leela. Business hotel ITC-Welcomgroup expects only marginal growth in November volumes. “International business is showing a bit of downslide in volumes from key source markets like the US and UK. However, we expect a 10-15% growth in international business," said Dipak Haksar, COO at ITC-Welcomgroup. Travel agents are also feeling the heat of the slowdown and the bomb blasts. “Just a day back, a family of 11 people from Spain cancelled their 15-day Rajasthan tour scheduled for November. The next few months don’t look good at all and we are expecting a 20-30% drop in inbound leisure travel this season," said Subhash Verma, managing director of New Delhi-based travel agency Travel Plus.